For the 1920s transatlantic airline, see Condor Syndikat. Condor Flugdienst GmbH, branded as Condor, is a German leisure airline based in Frankfurt. It operates scheduled flights to leisure destinations in the Mediterranean, Asia, Africa, North America, South America and the Caribbean. Its main base is at Frankfurt Airport from which most of its long-haul flights depart; secondary bases for Mediterranean flights are Munich Airport which also features long-haul flights, Hamburg Airport, Hannover Airport, Düsseldorf Airport, Stuttgart Airport, Leipzig/Halle Airport and Berlin Schönefeld Airport. Condor is Germany's third largest commercial airline based on fleet size and passengers flown. It is headquartered at Gateway Gardens near Frankfurt Airport with an important branch office at Berlin Schönefeld Airport. It is a subsidiary of the British Thomas Cook Group, but still partners with its former parent Lufthansa through the use of the Lufthansa Group's Miles & More program and its business lounges at Frankfurt Airport. Condor Boeing 767-300ER in 2003, featuring the Thomas Cook powered by Condor livery and titles that were introduced in the 1990s. The company was founded on 21 December 1955 as Deutsche Flugdienst GmbH, its ownership being split between Norddeutscher Lloyd (27.75%), Hamburg America Line (27.75%), Deutsche Lufthansa (26%) and Deutsche Bundesbahn (18.5%). The initial fleet of three 36-passenger Vickers VC.1 Viking aircraft was based at Frankfurt Airport, the Lufthansa hub. Scheduled flight operations were launched on 29 March 1956 with a pilgrimage flight to Israel. Further destinations flown to during the first year were Majorca and Tenerife. In 1959, Lufthansa took over 95.5 percent of the stake, thus creating its first post-war subsidiary. In 1961, Deutsche Flugdienst took over its rival Condor-Luftreederei (which had been founded in 1957 by Oetker), subsequently changing its name to Condor Flugdienst GmbH, thus re-introducing the "Condor" name with Lufthansa (there was a Brazilian subsidiary named Syndicato Condor between 1928 and 1943). In 1962, Condor Flugdienst transported ca. 32,000 passengers (18,400 of which to and from Majorca) and had a market share of 63.3 percent in the German leisure air travel. In 1966, the longhaul business was launched, with flights to Thailand, Ceylon, Kenya and the Dominican Republic. In 1971, Condor became the world's first leisure airline to add the Boeing 747 (at that time the largest passenger aircraft) to its fleet. In 1973, the airline generated a revenue of 291 million DM (then equivalent to 90.8 million USD), surpassing all other leisure airlines worldwide. At that time, the Condor fleet consisted of two Boeing 747-200s, two 707s and ten 727s. During this period the Condor Individuell system was launched, allowing direct flight bookings by passengers without the need of a travel agency. In 1989, SunExpress was founded as a co-operation between Condor and Turkish Airlines, aiming at leisure traffic between Germany and Turkey. Condor added Boeing 757 and Boeing 767 jets to its fleet, operated from the production workshop of Südflug, a 100% subsidiary of Condor. In 1991, as the first leisure carrier, Condor introduced a separate and more comfortable Comfort Class (Business Class) to its Boeing 767 long-haul fleet. The Südflug subsidiary was integrated into Condor in autumn 1992. In 1995, Condor expanded its shareholdings: Alpha Holding GmbH (30%), Kreutzer Touristik GmbH (37.5%), Fischer Reisen GmbH (100%) and Öger Tours GmbH, with 10%, became part of the Condor Tourism Group. Condor also acquired Lufthansa’s 40% holding in the Turkish charter airline SunExpress, which was later increased to 50%. In 1996, commemorating the 40th birthday of the airline, US painter James Rizzi created a special paint scheme which was applied to one of Condor's Boeing 757s. With an order for 12 aircraft, the airline became the launch customer of the enlarged Boeing 757-300. In 1998, Condor Flugdienst GmbH was owned by C&N Touristic AG (later Thomas Cook AG). With the merger of Condor Flugdienst GmbH and NUR Touristic GmbH, Deutsche Lufthansa AG and KarstadtQuelle AG created the basis for an integrated tourism group with a European format – both partners have a 50% holding in the company. In 1998, Condor Berlin GmbH was founded as a wholly owned subsidiary with headquarters at Berlin Tegel Airport. As with all other German airlines, Condor was not allowed to operate into West Berlin until 1990. It used Airbus A320 aircraft, which had recently been added to the fleet, replacing the Boeing 737 short-haul airliners. In the early 2000s, the Berlin business was moved to Schönefeld Airport. From 2000 onwards, the Condor shares held by Lufthansa were gradually acquired by Thomas Cook. The process of transforming Condor from a Lufthansa subsidiary to a part of Thomas Cook (along with Thomas Cook Airlines, Thomas Cook Airlines (Belgium) and Thomas Cook Airlines Scandinavia began with the rebranding as Thomas Cook powered by Condor on 1 March 2003. A new livery was introduced, featuring the Thomas Cook logo on the aircraft tail and the word "Condor" written in the font used by Thomas Cook Airlines. On 23 January 2004, Condor became part of Thomas Cook AG and returned to the Condor brand name. By December 2006, the remaining Lufthansa shares only amounted to 24.9 percent, so that the last influence (by a blocking minority) was lost. On 20 September 2007, shortly after having taken over LTU International, Air Berlin announced its intention to acquire Condor in a share swap deal. It was intended to buy the 75.1 percent of Condor shares held by Thomas Cook, with the remaining Lufthansa assest being acquired in 2010. In return, Thomas Cook would take up 29.99 percent of the Air Berlin stock. On 11 September 2008, the plan was abandoned. In December 2010, Thomas Cook Group chose the Airbus A320 family as preferred short-medium haul aircraft type for its airlines, with a review concerning the longhaul aircraft scheduled for 2011. On 17 September 2012, the airline signed a codeshare agreement with the Mexican low-cost carrier, Volaris. On 12 March 2013, Condor and the Canadian airline WestJet agreed on an interline partnership which will offer customers connecting flights to/from 17 destinations in Canada. This agreement expands the network of both airlines, allowing passengers to connect beyond each airline's own network. On 4 February 2013, the Thomas Cook Group announced that Thomas Cook Airlines, Thomas Cook Airlines Belgium and Condor would be merged into a single operating segment of the Thomas Cook Group. On October 1, 2013 the Thomas Cook Group began presenting itself under a unified brand symbol. 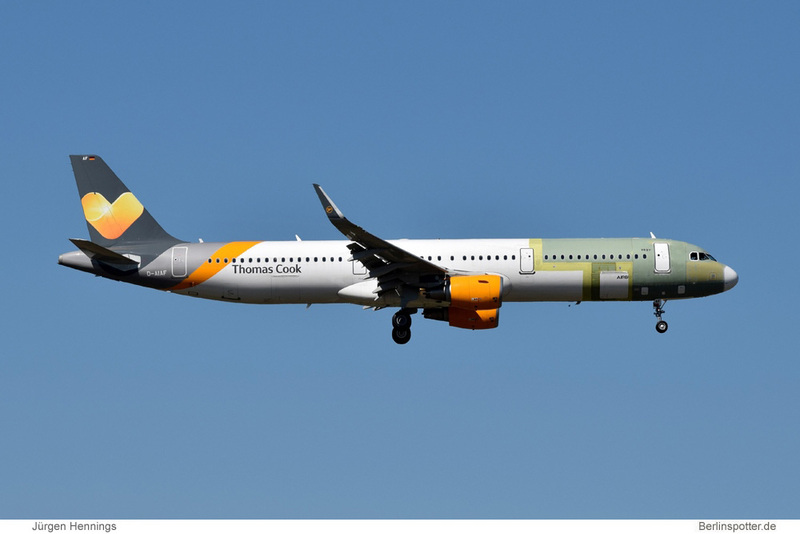 The aircraft of the Thomas Cook Group Airlines also had the Sunny Heart added to their tails and were re-painted in the new corporate color scheme grey, white and yellow. On the aircraft, the Sunny Heart on the tail is meant to symbolize the unification of airline brands within the entire Thomas Cook Group. Condor refurbished the cabins on all of its Boeing 767-300 long-haul aircraft. All economy class and premium economy class seats were replaced with new seats from ZIM Flugsitz GmbH. Condor kept its successful Premium Economy Class with more legroom and added services. The new Business Class seats (Zodiac Aerospace) offer fully automated, angled-lie-flat seats capable of inclining to an angle of 170 degrees with a bed length of 1.80m. The airline added seats in its new Business Class section from 18 to 30 seats on three of its Boeing 767 aircraft. New in-flight entertainment include personal screens for all passengers throughout all three classes of service. Condor will implement the RAVE IFE technology of Zodiac In-flight Entertainment. On 27 June 2014, Condor completed the cabin refurbishment for all of its long-haul Boeing 767 aircraft. The company is headquartered in Frankfurt am Main, Hesse. 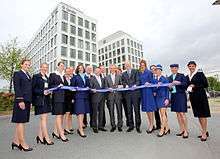 In January 2010 the airline held a groundbreaking for a new headquarters complex in Gateway Gardens, a business borough located in Flughafen, Frankfurt, across the Bundesautobahn 3 from Frankfurt Airport. 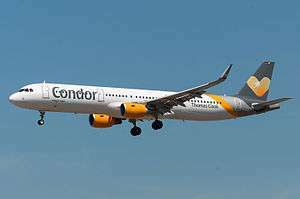 Ralf Teckentrup, the CEO of Condor, said that the new headquarters would place the airline's operations closer to Frankfurt Airport. 380 ground employees will work in the building, and pre-flight briefings for about 2,000 flight attendants will be held in the building. Prior to its redevelopment, the land of Gateway Gardens housed residences of families stationed at a U.S. military base. Groß & Partner and OFB Projektentwicklung developed the seven-floor facility. The 14,600-square-metre (157,000 sq ft) building is situated between the park and the central plaza, in the "Quartier Mondo" area of Gateway Gardens. It houses Condor's corporate headquarters, a training and education center with a flight simulator, and the airline's flight operations facility. 2,700 square metres (29,000 sq ft) of the facility includes small units rented to other tenants and a café and restaurant on the building's first floor. The building opened in the spring of 2012. The company user to be headquartered in Kelsterbach, Hesse. Aircraft maintenance is split between two wholly owned subsidiaries: Condor Technik GmbH (based at Frankfurt Airport with 160 employees) for the medium-long haul Boeing aircraft, and Condor Berlin GmbH (based at Berlin Schönefeld Airport with 80 employees) for the short-medium haul Airbus aircraft. Boeing 757-300 13 — 0 26 249 275 Launch customer. 1 in special 50th anniversary livery, named "Willi"
Boeing 767-300ER 16 — 30 35 180 245 1 in retro livery, named "Achim"
Fokker F27 Friendship 1965 ? Vickers VC.1 Viking 1955 ? With the refurbishment of its Boeing 767 fleet, Condor changed the name of its upper class cabin from "Comfort Class" to Business Class in 2014. Condor's Business Class is offered on all Boeing 767 aircraft. The seats (Zodiac Aerospace) convert to 170 degrees lie-flat beds with 180 cm in length and a standard seat pitch (in take off mode) of 60-inch (1,500 mm). The seats include power and USB outlets as well as a 15" screen for in-flight entertainment. Condor offers separate Business Class check-in counters at all airports that Condor operates long-haul flights from. Condor operates RAVE inflight entertainment throughout the whole cabin. Condor operates two different Premium Economy classes. The long-haul version (offered on all Boeing 767) offers regular economy class seats from ZIM Flugsitz GmbH with 15 cm (6 in) more legroom (1m, 36 inch seat pitch), more recline, free access to the in-flight entertainment and extra service. Condor's Premium Economy Class on short- and medium-haul flights comes with a free middle seat, added services and free meals. Condor's long-haul Economy class is offered on all Boeing 767 aircraft. All seats have a 30-inch (760 mm) seat pitch with a 17-inch (430 mm) width. The middle seats are slightly wider 2-inch (51 mm) than non-middle seats. A personal monitor is available at every seat in all classes giving passengers access to roughly 30 movies, more than 50 TV series, 24 radio channels and hundreds of audio music of all genres. All entertainment content is available to passengers in Business and Premium Economy Class. However, Economy Class passengers have only limited access. They get one movie, one TV episode, and the music library. 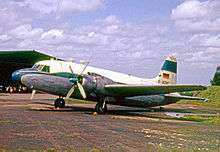 On 17 October 1958, a Deutsche Flugdienst (as the airline was called at that time) Vickers VC.1 Viking (registered D-BELA) on a cargo flight had to carry out a forced landing near Zele in Belgium due to an engine fire. Upon impact, the aircraft caught fire and was destroyed, but all three crew members on board survived. On 31 July 1960, a Deutsche Flugdienst Convair CV-240 (registered D-BELU) en route from Frankfurt to Rimini experienced failures in both engines upon approaching Rimini Airport. The pilots had to carry out an emergency landing 1000 metres short of the runway, which resulted in the death of one passenger (out of 30, with additional four crew members on board) and the aircraft being written off. On 20 July 1970, a Condor Boeing 737-100 (registered D-ABEL) which was approaching Reus Airport, collided with a privately owned Piper Cherokee light aircraft (registration EC-BRU) near Tarragona, Spain. The Piper subsequently crashed, resulting in the death of the three persons on board. The Condor Boeing suffered only minor damage, and there were no injuries amongst the 95 passengers and 5 crew members. On 2 January 1988 at 19:18 local time, Condor Flugdienst Flight 3782, a Boeing 737-200 (registered D-ABHD) on a chartered service from Stuttgart to Izmir, crashed into a hill near Seferihisar whilst approaching Adnan Menderes Airport, killing all 11 passengers and 5 crew members on board. A flawed ILS-approach was given as cause for the accident . On 24 June 1992, a Condor Boeing 767-300 (registered D-ABUZ) took a wrong turn after departing Porlamar Airport in Venezuela on a charter flight back to Germany, resulting in an overflight of mountainous terrain at a low altitude. The aircraft hit a TV mast on top of El Copey (with 890 metres the second highest peak on Isla Margarita) with its left wing. The wing was substantially damaged (but could later be repaired), and the pilots managed to return to Porlamar Airport, without any of the 251 passengers and 12 crew members on board being injured. On 2 December 2015, a Condor Airbus A321-200, registration D-AIAF, was being towed at Berlin's Schönefeld Airport when the left wing struck a light tower. The tower collapsed and fell on the aircraft tearing open a section of fuselage of the cockpit injuring a technician in the cockpit. The aircraft has been repaired and put back into service. ↑ "Directory: World Airlines". Flight International. 3 April 2007. p. 68. ↑ "Historical US Dollars to German Marks currency conversion". Retrieved 10 July 2015. 1 2 3 4 5 6 7 8 9 10 11 12 "AeroTransport Data Bank". Retrieved 10 July 2015. ↑ Flightglobal: Air Berlin consolidates market position with Condor takeover. Published online on 24 September 2007. ↑ "Condor und mexikanische Volaris schließen Partnerschaft". 17 September 2012. Retrieved 12 November 2012. ↑ Reuters: Thomas Cook shakes up airline business. Published online on 5 February 2013. ↑ 740KVOR: The Thomas Cook Group Unites as One Team With New 'Sunny Heart' Brand Published online on 1 October 2013. ↑ "Condor Premium Economy Class; Condor Air Lines". www.condor.com. Retrieved 2013-10-15. ↑ "New Cabins for Condor's Entire Long-Haul Fleet". Marketwire. Retrieved 10 July 2015. ↑ "Condor - News". Retrieved 10 July 2015. ↑ "Fairplay Sustainability Report 2007." Fraport. 6. Retrieved on 28 May 2011. ↑ "CONDOR FLUGDIENST GMBH." Gateway Gardens. Retrieved on 28 May 2011. ↑ "How to find us." Condor Flugdienst. Retrieved on 28 May 2011. "Condor Flugdienst GmbH Am Grünen Weg 1 – 3 65451 Kelsterbach GERMANY" and "Condor Flugdienst GmbH (location Oberursel) Thomas-Cook-Platz 1 61440 Oberursel GERMANY" and "Condor Berlin GmbH Airport Berlin-Schönefeld Postfach 12521 Berlin GERMANY" and "Condor Technik GmbH Cargo City Süd, Gebäude 507 60549 Frankfurt/Airport GERMANY"
↑ "How to find us in Kelsterbach. "(German) Condor Flugdienst. Retrieved on 28 May 2011. ↑ "Condor Fleet Details and History". planespotters.net. 12 October 2016. Retrieved 22 October 2016. 1 2 3 "Sonderlackierungen" [Special Liveries]. condor.com (in German). Condor Flugdienst GmbH. Retrieved 3 August 2016. 1 2 3 4 5 6 7 8 9 10 "Condor Fleet - Airfleets aviation". Retrieved 10 July 2015. ↑ "Condor (Berlin) hat über den Sommerflugplan einen A319 von Hamburg Airways geleast. D-AHHB hat dadur - Flugzeug-bild.de". Retrieved 10 July 2015. ↑ "Condor to wet-lease B737-800s from Sun Express Deutschland". ch-aviation. Retrieved 10 July 2015. 1 2 "ASN Aircraft accident Convair CV-240-4 D-BELU Rimini Airport (RMI) 31 July 1960". Aviation Safety Network. Flight Safety Foundation. Retrieved 10 July 2015. ↑ "Douglas DC-8-33, D-ADIM, Condor (DE / CFG)". Retrieved 10 July 2015. 1 2 "ASN Aircraft accident Vickers 610 Viking 1B D-BELA Zele 17 October 1958". Aviation Safety Network. Flight Safety Foundation. Retrieved 10 July 2015. 1 2 "Flight Review: Checking Out Condor Airlines' Business Class to Frankfurt - AirlineReporter.com". AirlineReporter.com. Retrieved 10 July 2015. ↑ "Condor Planes, Fleet and Seat Maps". Retrieved 10 July 2015. ↑ "SeatGuru Seat Map Condor Boeing 767-300ER (763) V1". Retrieved 10 July 2015. ↑ "Condor Gives Wider Middle Seats". AirlineReporter.com. Retrieved 10 July 2015. ↑ "SeatGuru Seat Map Condor Boeing 767-300ER (763) V2". Retrieved 10 July 2015. ↑ Harro Ranter (20 July 1970). "ASN Aircraft accident Boeing 737-130 D-ABEL Tarragona". Retrieved 10 July 2015. ↑ Harro Ranter. "ASN Aircraft accident 20-JUL-1970 Piper PA-28-140 Cherokee EC-BRU". Retrieved 10 July 2015. ↑ Harro Ranter (2 January 1988). "ASN Aircraft accident Boeing 737-230 D-ABHD Seferihisar". Retrieved 10 July 2015. ↑ Harro Ranter (24 June 1992). "ASN Aircraft accident Boeing 767-330ER D-ABUZ Cerro Copey". Retrieved 10 July 2015. ↑ "Condor A321 Ground Incident At SXF Civil Aviation Forum - Airliners.net". Retrieved 16 April 2016. ↑ "Lichtmast-Crash in Schönefeld: Mitarbeiter schrottet 100-Mio.-Flieger". BILD.de. Retrieved 16 April 2016. ↑ "D-AIAF Condor Airbus A321-211(WL) - cn 6459".